How do you know you've got a good resource? Your students recommend it to their peers. Science teacher Liz Greflund discusses how Greenwood's chemistry resources bring the best of the new and the traditional to the science classroom. Blended learning in chemistry has evolved over the past few years at Greenwood. As a team, the chemistry teachers have been determining how to use course resources to best enhance student learning. Our aim is to increase student perseverance while providing a supported education in chemistry. The teacher runs a lesson and coordinates activities. The Moodle page contains many resources that students can use to solidify their understanding. We make an effort to build community in class, often beginning with a starter to get the students engaged and working efficiently. We then move on to a lesson which ends with students practicing the material. Completed class notes: These are posted for student reference, as well as a variety of activities, videos and interesting links. 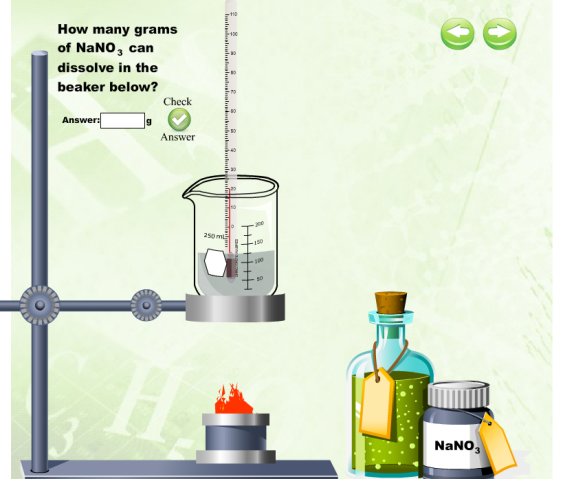 Visual learning: The image included here comes from a flash animation developed for the Grade 11 Chemistry course. For some, it is the visual reinforcement that allows students to understand the problem as opposed to memorizing the process. Online problems: Students complete a series of problems, and check each answer before moving to the next problem. Prompting is given if the answer is incorrect. Students respond well to these resources. I often hear students say “you should watch the video - it was really useful." We constantly evaluate the effectiveness of the resources, and we think we have found a nice balance. The students enjoy the demos, lab and lessons that run during class and are able to access the material at home as they wish. We think this blend is the best of both worlds.